America's Jewelry Box | Mele & Co. Helping you organize your jewelry is our story, but what’s yours? 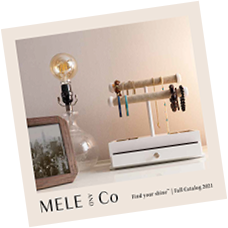 Share your Mele & Co. experience and post a photo - we'd love to hear from you! Read & share your own story! We offer so many styles and categories, we know selecting the perfect gift can be tough. No worries! Use our “Gift Finder” to help organize your selections!